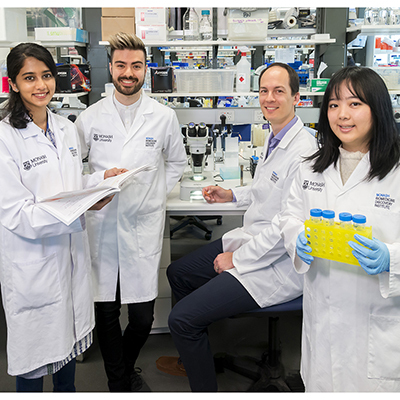 Monash University’s Biomedicine Discovery Institute scientists have used tiny nematode worms to reveal the signals controlling the mechanism by which severed nerves can self-heal. Moreover, they have demonstrated how to modulate this process genetically, raising hopes for treating nerve injuries in humans in the future. Nervous system injuries, such as those to the spinal cord, can cause lifelong disabilities because our bodies are unable to fully repair themselves. Led by Dr Brent Neumann, and in collaboration with researchers from the Queensland Brain Institute at The University of Queensland, the research team built on its landmark 2015 findings in which the scientists characterised ‘axonal fusion’, a highly efficient yet simple repair process. Axonal fusion, observed in several species, allows severed nerve cells (neurons) to form a bridge across their damaged section. The latest research, published today in the journal Proceedings of the National Academy of Sciences (PNAS), established that axonal fusion restores full function to damaged nerves. The scientists used a laser beam to sever a single neuron in the one-millimetre long C. elegans, a transparent nematode (roundworm), and observed how it regenerated, finding that the function associated with this neuron was restored within 48 hours. The two ends of the transected nerve are able to recognise each other and reconnect due to specific ‘save-me’ signals, in the form of the phospholipid phosphatidylserine, displayed on the surface of the damaged nerve. The researchers demonstrated that a level of 'save-me' signals was essential for the process to occur and that it was possible to manipulate this genetically. “Basically the ‘save-me’ signal is really controlling whether you can regrow nerves through this fully functional method of regeneration. It’s critical for the process,” said Dr Neumann, who heads the Nervous System Development and Repair laboratory. The nematode worm is ideal for research into nerve injury repair because it has a very simple nervous system and because the biological mechanisms involved are ‘conserved’ and similar to those in humans, he said. Associate Professor Massimo Hilliard, Principal Research Fellow at the Queensland Brain Institute, said the discovery adds another important step towards finding new ways to treat nerve injuries. This research was supported by the National Health and Medical Research Council.